Hotel interior hides and uncovers various areas providing the hotel guests with space to relax and unwind. 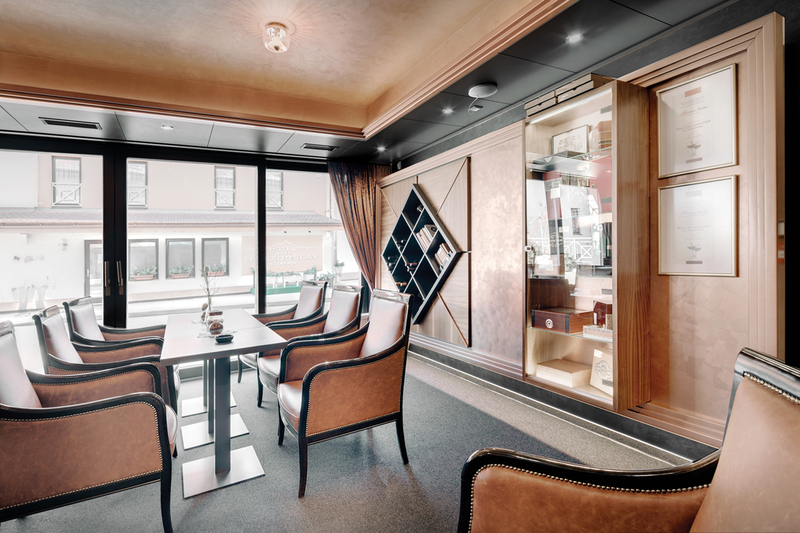 One of them is represented by the exclusively furnished interior of the Cigar and Cognac Bar in Hotel Hviezdoslav. The luxurious equipment of this interior creates a calming atmosphere and also an opportunity to enjoy the daily cup of coffee to the fullest. Apart from this, one can also enjoy here top-quality cognac beverages. Of course, accompanied by the finest selection of cigars and other gourmet products pleasing a high variety of customer tastes and preferences. 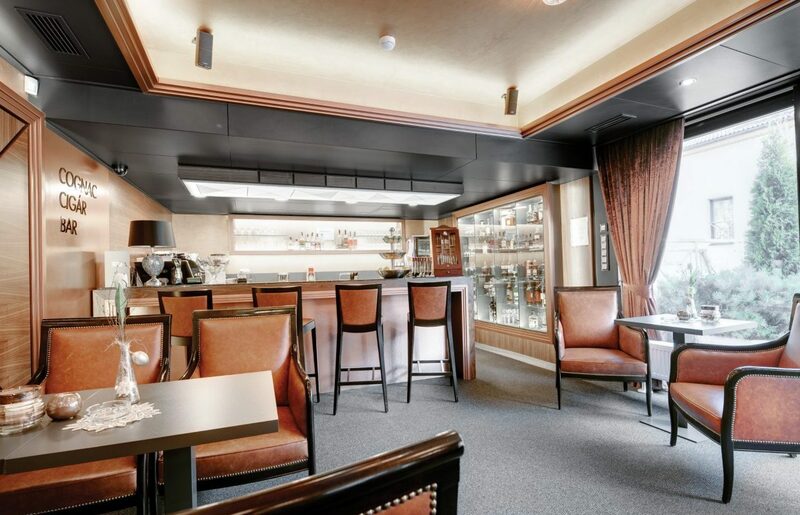 The bar of Hotel Hviezdoslav is equipped with luxurious hotel furniture selected with a special focus on the interior aesthetics and comfort. High SELVA armchairs covered in leather represent one of the main features of this comprehensive interior equipment. 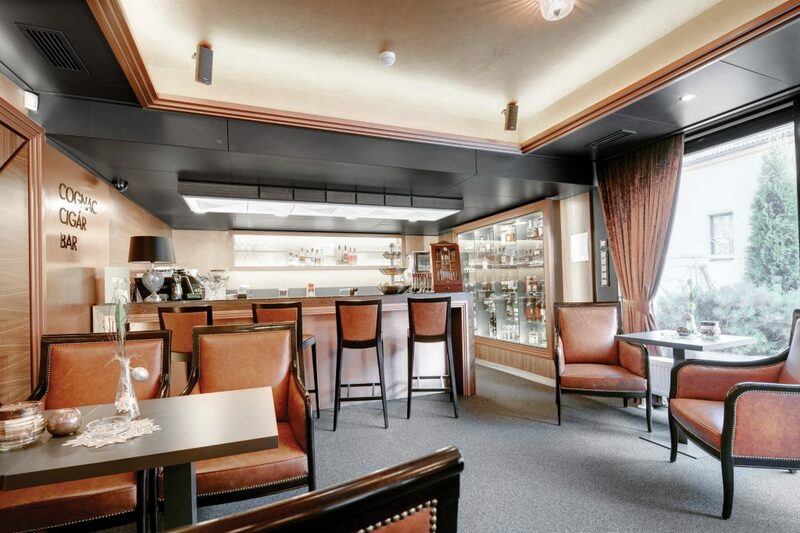 Hotel bar includes a stylish seating area with chairs coming from our Italian partner CIZETA. Furthermore, the tailor-made counter combines nut wood, copper and natural stone. These premium materials represent the core building blocks for the overall commercial design of this boutique hotel. A dominant element in the room is the decorative covering on walls and ceilings made from multi-level wooden panels. This innovate solution is characterized by a high degree of aesthetics, bold structuring and varying orientation of the nut wood. These coverings are complemented by elegant copper molding. The same decors are present also in the library and cigar showcase part of the room. The lower ceiling with a stunning surface conditioning made from copper evokes feelings of comfort and coziness. Right at the entrance you can find a big exhibition case for cognacs which serves also as a powerful room decoration. Indirect lighting and lamps in premium look provide the interior space with a comfortable level of brightness. An atypical lighting panel above the bar includes a semi-transparent textile playing an important role in the perceived interior atmosphere. When speaking about the area behind the counter, we have created a rich space for preparation and presentation of various drinks and gourmet foods.